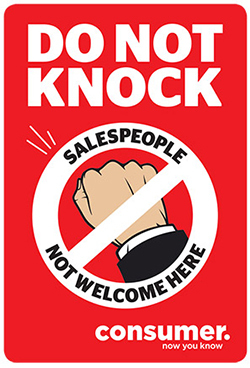 If the aim is to send pesky visitors packing, then the “Do not knock” stickers being distributed by Consumer NZ aren’t up to the job. I’ve crafted an alternative and I’m happy to offer it to them free of charge. They might need a slightly bigger sticker though. Here goes. Hello friend! Are we acquainted? Are we related? Are you a helpful neighbour here to tell me my car is on fire? A solemn police officer with bad news? A council officer come to tick me off for watering my garden on the wrong day? A bereaved Nigerian looking to shift some funds offshore? None of these? Then be still, beating fist! Keep those calloused knuckles in your pockets! Be gone, before my cats rub themselves against your leg and drool on your shoes! Turn tail! Make tracks! Save yourself! But perhaps you are here to save my soul. I’m sorry, but this is a godless, faithless, feckless household. We have no souls here worth saving! We have no confidence that your imaginary friend will cure our back pain or lighten our crushing sense of ennui. We prefer our imaginary fiend – you call him Lucifer; we call him Dawkins. No, please, don’t go! I’d love to tell you more! Oh, you’re here to sell me a new energy plan! So tell me: is your gas gassier? Is your electricity sparkier? Will you slash my bills more cruelly than the other lot? Thought not. But while you’re here, could you check this light? It keeps cutting out. And that plug has stopped working. You can’t? But I thought you were an energy specialist! But wait! Is that a smartly uniformed diminutive figure I see hovering expectantly through the frosted glass of my door? Come in! Come in and take tea with my wife and I and we’ll share a laugh or two! Oh, so Brown Owl says that would be unwise? Fine, we’ll take six packets please.